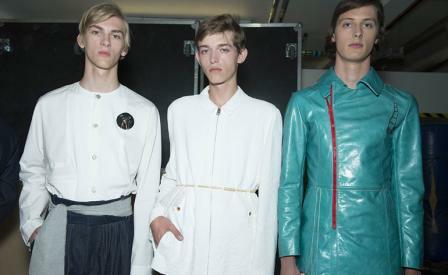 Mood board: There was something intergalactic about JW Anderson's (inter)stellar spring/summer 2016 collection that was dominated by Luke Skywalker-style Judo jackets and tunic tops engineered with protruding shoulders. These were teamed with pleated, drop crotch trousers that furthered the 10cm turn-up hem trend that Jonathan Anderson first ignited at Loewe. Best in show: A sand hued, collarless six-button jacket that was adorned with random, organically shaped leather patches and a drop-waisted, trench. Also beaming: Anderson's NASA-inspired palette of primary hues and 'news' intarsia. Finishing touches: Never shy of blurring the gender divide, silver brooches dangled with the keys that were missing from Anderson's 'shelf' bags that housed a range of key chain trinkets from whistles to jingling bike motifs. Under foot, safety buckles secured patent red and silver leather loafers and wrap closure sandal/booties.